In our previous article, The Hacker News reported that the EFF had won its battle over the limits that were put on a car's copyrighted software, allowing car owners to fiddle with their car's software. Ripe off video from DVDs or BluRay disks, as well as online streaming services, for remixes. 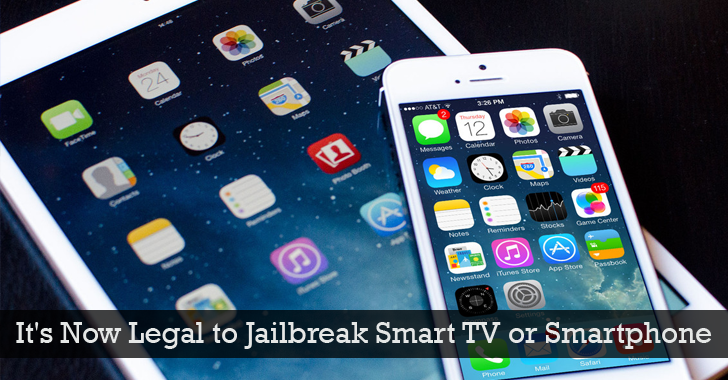 Jailbreak their phones, tablets, and smartwatches and run operating systems and applications from a third party source. Reconfigure video games that are no longer supported by their publisher. "We are pleased that the Librarian of Congress and the Copyright Office have expanded these legal protections to users of newer products like tablets, wearable computers, and Blu-Ray discs," EFF Senior Staff Attorney Mitch Stoltz says. Previously in July 2010, the United States government ruled that the jailbreaking, unlocking and rooting of Apple iPhones and Android devices was a legal act, as long as they are not violating the Copyright Law. After that, within two years in January 2012, the U.S. Government put a ban on Jailbreaking and Rooting of the smartphones. However, this time the decision ruled out by the U.S. Government must stay, unlike the trend it has followed in the past years.